Of Christopher's childhood days. . .
And no need to worry, all of his enchanted friends are still there to say "Hello" again in Disney's new film, Christopher Robin! There is so much to love about this film, for both kids and adults making it a great family movie night treat. 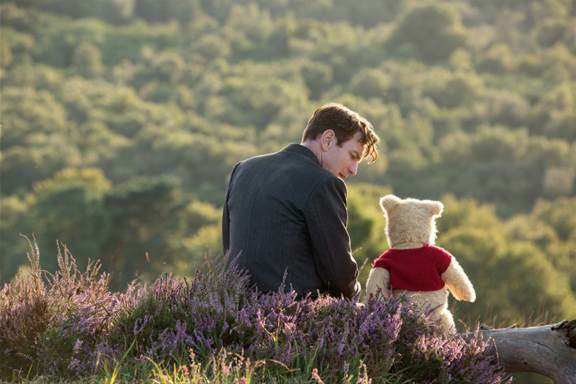 What's to love for Adults - Regardless of where you are in your journey of adulthood, you will most likely find something to relate to in the character of Christopher Robin. Without giving away spoilers, the movie tells the story of Christopher Robin after he leaves the Hundred Acre Wood as a child and goes off to boarding school. A quick synopsis of his childhood and young adult years give you an understanding that life happened to Christopher Robin and he changed from the little boy whose only fear was Heffalumps and Woozles. Christopher Robin is now married with a child of his own, but like many of us finds himself struggling to balance the demands of work with the needs of his family. When Winnie the Pooh finds Christopher Robin all these years later in London, Pooh says he recognized him because the little boy he was is still in there - even if he has some wrinkles! (Ain't that the truth for all of us!) Winnie the Pooh needs Christopher Robin's help and through his expedition with Pooh, Christopher Robin returns to the Hundred Acre Wood, is reunited with his old friends, and remembers who he really is. I found myself tearing up in parts of the movie (which in all honesty happens frequently to me during Disney movies) as Christopher Robin struggled with who he is and who he wants to be. What's to love for Kids - To be honest, I wasn't sure if my little ones were going to enjoy the movie. Everything I had seen in the previews, seemed to tell a heartwarming and compelling story, but it wasn't one that I thought my kids would understand. While I doubt they connected with the movie the same way I did, they found plenty enjoyable and humorous in the film. Many times, I found my 6 year old laughing out loud and he'd look over to me and say "now that's funny right there!" After the movie, I asked what his favorite part was and he described a scene where Christopher Robin goes to jump in a stream in the Hundred Acre Wood. He grabs his nose and prepares for a big jump, but when he hops in, it's only shin deep. He quickly laughs and comments about the fact that now he is all grown up. Pooh's love of honey, Eeyore's gloomy attitude, Piglet's nervous nature, and Tigger's bouncing are all prominently featured and keep kids smiling for ear to ear. Even my 3 year old fell in love with Pooh as he talked about the "rumbly in his tummy." Overall, this is another live action hit for Walt Disney Studios. I now have my boys asking to go back and watch our Winnie the Pooh cartoons as "Pooh Fever" has hit our house. This movie will get you laughing out loud and tug at your heart strings. 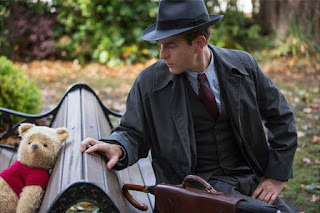 Christopher Robin opens everywhere August 3rd and advanced tickets are available now! Disclaimer: My family and I received complimentary admission to an advanced screening of Christopher Robin. As always though, all opinions about the film are my own!